Every greyhound adopted through National Greyhound Adoption Program is given a T4 test. 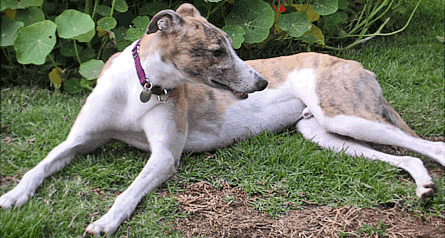 The primary purpose of this test is not to determine if your greyhound is hypothyroid, but rather to establish a baseline of where your greyhound’s thyroid level is. A high percentage of greyhounds will test below the normal test range of 1.0 - 4.0, but will show no signs of hypothyroidism. Our greyhounds may have a low thyroid level according to the T4 test but he may not necessarily need thyroid supplement if he is not showing clinical signs. Many greyhounds will go through life with a thyroid level below normal and never need supplementation. The fact that your greyhound may be in the normal range but shows traits of low-esteem does not mean your greyhound need not be treated. Greyhounds that are low-esteem, shy, thunderstorm phobic, spooky, and/or afraid of visitors all fit into this category of dogs that would probably benefit from thyroid supplement. Clinical signs are the primary factors in determining if your dog should be treated, as opposed to test results. Our most significant concern is how your greyhound feels about himself and his general esteem level. If it is determined here at NGAP, or due to your observations and concerns once you get your greyhound home, that your greyhound should be on thyroid supplement, we will supply it to you, initially for free. We generally will give a greyhound Soloxine, which is the brand name, as opposed to the generic. In our view, the brand works better. After your greyhound has been on it for one month, it is a good time to evaluate if the supplement has helped and to what degree and whether or not the dose should be increased or decreased. In any case, you should be discussing with the NGAP Director how your greyhound is doing on thyroid supplement at the one month mark. We may suggest an additional T4 test, whether done by our staff or another veterinarian. Keep in mind that thyroid tests or blood work should be done five hours after your greyhound receives the medication. Timing is very important with this test and medication administration significantly before or after the five hour mark will skew the results and make them worthless. On very rare occasions, thyroid supplement can make your dog hyperthyroid. If your dog becomes hyperthyroid he may show signs such as becoming more easily agitated or aggressive. If you see this happening, immediately reduce your greyhound’s Soloxine dose to half of what you were currently giving him and call the office to advise them of the problem. NGAP has treated more greyhounds with thyroid supplement than probably anyone in the world. We have seen wonderful results from it in many greyhounds. Thyroid supplementation is generally given for life and dogs that are taken off of it will often regress, although their regression does not appear to be as severe as from where they originally started. Some veterinarians have suggested that greyhounds on thyroid supplementation may have adverse long-term effects from the supplementation. We have not seen that to be the case and many greyhounds on supplementation live long and much happier lives because of it. Where to get the right supplement? Soloxine can be purchased through NGAP at the cost of 160 tablets for $25 or you can ask your local veterinarian to issue a prescription.